When NBA All-Star festivities begin this weekend in New York, the Phoenix Suns will be represented by a point guard who signed a new contract over the summer who is not named Eric Bledsoe. 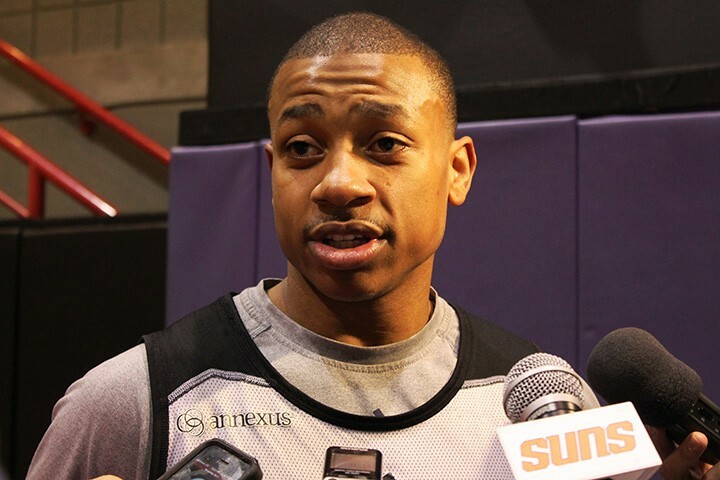 Isaiah Thomas, who signed a four-year, $27 million contract, is the lone representative on a Suns team that sits 29-24 and eighth in the Western Conference playoff standings. He is averaging 15.3 points and 3.7 assists in an off-the-bench role. On Saturday, Valentine’s Day, he will participate in the Taco Bell Skills Competition. This year’s competition will feature a new format in which players face off against one another in a bracket style tournament. Thomas sounded confident with his first-round opponent, John Wall of the Washington Wizards. The three-pointer could give Isaiah a leg up on the competition because he is shooting 39 percent from beyond the arc, second best among all the participants. Only Milwaukee Bucks guard Brandon Knight is shooting better at 41 percent. To prepare, Thomas is watching YouTube videos of past contests. He likes the new head-to-head competition instead of the previous team format. He is there to win, hoping to follow Steve Nash as the second Suns player, and the shortest, to win the Taco Bell Skills Competition. Nash won in 2005 and 2010. Goran Dragić, who participated in the skills competition last year, offered Thomas some input. This is Thomas’ second trip to All-Star Weekend. He participated as a member of the Kings in the 2013 Rising Stars Challenge. Accompanying him will be his fiancee, a couple friends and his parents. Don’t expect to see Thomas at the All-Star game Sunday, “I can watch the game on TV.” His next goal: Playing in the game. Phoenix Suns guard Isaiah Thomas is looking forward to shooting three-pointers in the expanded Taco Bell Skills Challenge on All-Star Saturday.